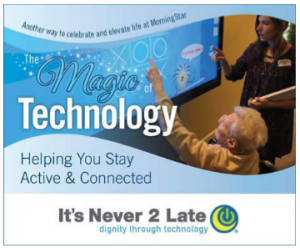 MorningStar is proud to offer the revolutionary “It’s Never 2 Late” technology. 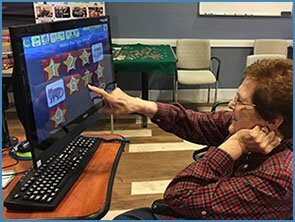 This state-of-the-art engagement system combines touchscreen computers with intuitive, picture-based software. Its library contains 3,000 choices for social and spiritual connection, intellectual and physical stimulation, emotional support and vocational interests—all the core dimensions of wellness.Through “My Page,” iN2L becomes even more personal. Add your favorite games, email addresses, family photos, websites. Share your history, preferences and personality with our team members.